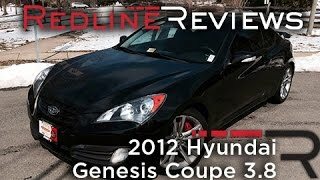 The Hyundai Genesis Coupe 2012 is a rear-wheel drive sport coupe featuring two performance-focused engines – a 210-horsepower, 2.0-liter turbocharged four-cylinder engine and a range-topping all-aluminum, 306-horsepower, DOHC 3.8-liter V6 engine. 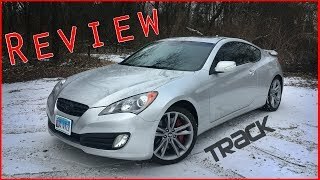 Overall, the Genesis Coupe bears a excellent driving dynamics which is married with a sporty interior design and the end result a good solid sports coupe. Check it out after the jump. 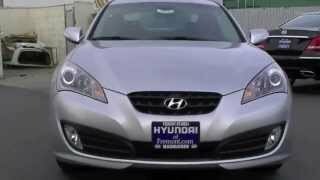 The Genesis Coupe comes out fighting in 2012 with excellent rear-wheel driving dynamics, sporty interior design, good value and strong four-cylinder fuel economy. A sleek design and outstanding performance capabilities make the 2012 Genesis Coupe an attractive sports coupe package for car buyers looking to make a statement on the road. 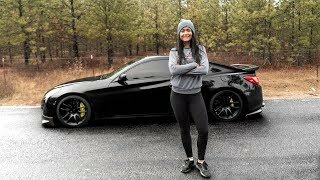 Genesis Coupe is a purpose-built rear-wheel drive sport coupe featuring two performance-focused engines – a 210-horsepower, 2.0-liter turbocharged four-cylinder engine and a range-topping all-aluminum, 306-horsepower, DOHC 3.8-liter V6 engine. Genesis Coupe is Hyundai’s most dynamic performance car, appealing directly to the true driving enthusiast. Genesis Coupe uses the same flexible rear-wheel drive architecture developed for the Genesis sport sedan. Two engines infuse Genesis Coupe with performance. The 3.8-liter Lambda DOHC V6 engine delivers 306-horsepower and 266 lb-ft of torque on regular unleaded. This engine will launch the Genesis Coupe from 0 to 60 miles per hour in 5.5 seconds. To maximize the power band, the 3.8-liter engine utilizes DCVVT and a new Variable Intake System (VIS) that helps cylinders breathe more efficiently at both low and high RPM. Better-breathing results in outstanding off-the-line acceleration, passing performance and remarkable fuel efficiency. The V6 engine uses an alloy block and cylinder heads for lighter weight and thermal efficiency, and features durable timing chains with no scheduled maintenance. The turbocharged, intercooled 2.0-liter DOHC inline four-cylinder benefits from CVVT on both the intake and exhaust camshafts. The 2.0-liter turbo generates 210-horsepower and 223 lb.-ft. of torque, with a fuel economy rating of 21 mpg city and 30 mpg highway for the manual transmission (20 mpg city/30 mpg highway automatic transmission). It also features a cast-aluminum cylinder block and cylinder head. Both engines feature a free-flowing dual cat-back exhaust and an available Torsen® limited-slip differential to put the power to the ground. 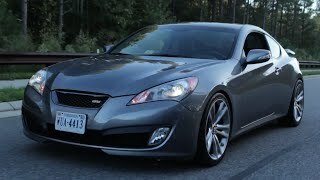 Genesis Coupe employs a MacPherson® strut dual-link front suspension and a five-link independent rear suspension setup. The front suspension is mounted to the body via a solid subframe which is lighter and stronger than a multi-piece component. To help reduce body roll and tune the Genesis Coupe’s at-the-limit handling for maximum predictability, 24-mm diameter front and 19-mm diameter rear stabilizer bars are used. While all Genesis Coupe models offer an engaging driving experience, the high-performance Genesis Coupe R-Spec and 3.8 Track models are the most willing partners for the true enthusiast. The track-tuned suspension features a stiffer front and rear spring rate and unique shock valving. The Genesis Coupe R-Spec and 3.8 Track models deliver a substantial increase in roll control over standard versions of the Genesis Coupe. Superb structural rigidity sets the foundation for precisely-tuned handling performance in all Genesis Coupes. Both engines are mated to a standard six-speed manual transmission. The Genesis Coupe 2.0T offers an optional five-speed automatic with SHIFTRONIC® while the 3.8-liter V6 offers a ZF® six-speed automatic transmission with SHIFTRONIC to handle the additional torque. Both automatic transmissions feature steering-wheel-mounted paddle shifters. Brembo four-piston calipers clamp down on 13.4-inch ventilated front brake rotors and 13-inch ventilated rear rotors on R-Spec and 3.8 Track models. All other models get substantial 12.6-inch front ventilated rotors and 12.4-inch rotors in the rear with floating single-piston calipers. Genesis Coupe 3.8 Track offers Xenon high-intensity discharge (HID) headlights. The advantages of HID headlamps include greater lighting power, daylight-type lighting and reduced power consumption. Music lovers will welcome the Genesis Coupe’s standard auxiliary input jacks (3.5 mm mini-jack and USB input) to accommodate and charge audio devices such as iPods®. There is an optional in-dash navigation unit with a multi-gauge information display screen. This system provides new features including Bluetooth streaming audio capability. This easy-to-use unit can be controlled via a 6.5-inch WVGA touchscreen or voice-recognition by headliner-mounted microphone. In keeping with Hyundai’s focus on offering segment-leading standard safety technologies across its lineup, the Genesis Coupe includes a wide range of both active and passive safety features. Standard safety technologies include driver and front passenger advanced frontal airbags, along with front seat-mounted side airbags, side air curtains and active front head restraints. Electronic Stability Control (ESC), one of the industry’s most effective life-saving technologies, is standard in all Genesis Coupe models. Both Genesis Coupe and sedan are rich in ultra-high-strength steel, leading to world-class body rigidity. At just 3,294 pounds, the Genesis Coupe 2.0T is hundreds of pounds lighter than all of its IRS-equipped rear-wheel drive competitors, with outstanding body-bending rigidity. This focus on weight efficiency pays dividends across the board. The Genesis Coupe 2.0T sets a high fuel efficiency bar with a remarkable 30 mpg estimated EPA highway rating, because of its weight-efficient platform and its efficient 2.0-liter, low-pressure, turbocharged four-cylinder engine. To reduce cost, weight, and complexity, R-Spec eliminates some non-essential convenience equipment such as automatic headlights, cruise control and some chrome/metalgrain interior accents.